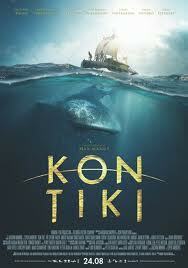 The Weinstein company has just aquired the rights to Kon Tiki, a Norwegian film based on Thor Heyerdahl's world-famous ocean adventure tale Kon Tiki: Across the Pacific in a Raft, published over half a century ago in 1950. I'm shocked to see that someone has just now made a film of it; I can't quite believe it hasn't been done before! I remember reading the book somewhere in my teen years. A million, nay, a billion years ago. I can't imagine why I picked the book up at the time- it may have belonged to my brother - and I don't remember the details, but I recall being completely enthralled by this blond sun-kissed adventurer and his journey. In fact, Thor Heyederdahl himself made a companion documentary film which won the Academy Award for Best Documentary in 1951. Before my time dear reader, if ever so slightly. This new 2012 version is the official Oscar® entry of Norway for Best Foreign Language Film. It seems to be the first actual dramatization of Heyerdahl's book. The trailer (below) features both English and Norwegian, along with subtitles, and looks pretty exciting. Harvey Weinstein has said he plans to release an English language version in 2013. Not sure if he intends to remake in English with known American actors or whether there is an English language version of the Norwegian movie which is doing great numbers in Norway and the rest of Europe now. 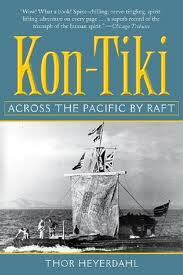 So tell me, has anyone actually read Kon Tiki recently? How does a movie version of a cross Pacific trip in a balsa wood raft, complete with shark attacks, sound to you? I'm not sure why this sounds familiar. I don't think I've ever read the book. But I can guess why it's suddenly a good idea to make this movie -- The Life of Pi ring a bell? Wow Paulita - all that water! - I think you have a point! I REALLY can't wait for that one. It looks gorgeous. This is exciting! I only read excerpts from this book when I was a kid, but I love high seas adventures. Looking forward to seeing whatever Norway and Weinstein have to throw at me. Great - glad you're into it ... and that you remember it at all! Is there still much call for the book? I don't know that I've ever read the book, the journey is certainly famous though. I found the trailer a bit confusing- are whale sharks supposed to be attacking? I know there were other sharks too. I'd be perfectly happy with the Norwegian original, hopefully it will make it to Australia (although no Aussie release date is listed on the imdb site)- we prefer originals to American remakes most of the time- I certainly do. Hopefully the movie will have the book rereleased. I have read the book a number of times over the years, and still have to constantly remind myself, "This was real. They actually did this." It's a great real-life adventure story, so I hope the movie doesn't have too much fictionalisation added for dramatic effect. If the film is only half as good as the book, we're in for a treat.